Saygreeeeenngrin. : MCKL OB Night! One nite to remember. MCKL OB Night! One nite to remember. There was the usual performance - Dancin', singin' and even a sketch. Aww.. too bad our performance wasn't inside. Sad. Hmm.. the Ball's also the official handover of the Student Council to the new committee. Gratz the new Mr.President Erik! Gratz Dai Lou Caleb! Gratz gratz! There's also a lucky draw. Guess what, the prize's a netbook worth RM1,200! Urgh.. all the seniors got the draw. *Not fair not fair. Hohoho. Everybody was just beautiful last night. Oh yeah, and gratz to those who won the Best Dressed plus Freshie King/Queen Award~ Really proud that the people in our class got at least, into the nominees. Kekek. The food was just neutral, normal~ Nothin' special for a Ball. Heheh. Sorry, not my taste. Oh well, the fun ends there. Haha. Woke up real late this mornin' and I'm still feelin' tired. It's like I had a drug overdose. Kekek.. I was suppose to wake up at 8 or 9 this mornin' to catch a basketball game with Mr.Leong. Oh man.. I feel bad with just a mention of his name. He's like the best lecturer in this college, the most sporting, Lan Si, witty, sillly, lame, plus all the shyt you can think of but he's still the best of the best, and he's leaving already. Awww~ This is just so so sad. =( Correction: LEFT. And he's bringin' dear Mr.Lee away too. What?!@#$?!! 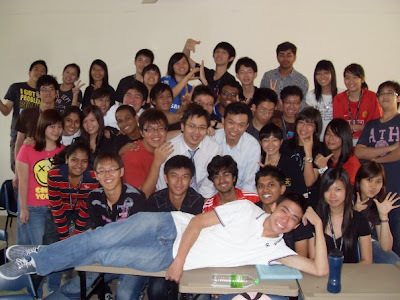 Mr.Lee's our maths lecturer if I've not mention him before. Not just any ordinary maths lecturer, mind. Remember Puan.Chong? Darn* He's the male version of her. He's some kinda Olympic Mathematics Champion too blabla~ You name it, he's it. Awww... I'm in the need of an anti-depressant. Sobsob. Some even said they were leavin' this college for good! If not they're considerin' on changin' to Arts stream now. Aww... Eva! Stevan! Sze Yun! Don't leave! Not after all the bond we've made! We're seriosuly havin' a college dilemma now. With two greatest of the greatest tutor gone and we're still stuck with the prodigious(AhemAhem*) Physics lecturer, seems like we're all dead meat now. x.X This is no joke man.. No JOKE. Whoosh.. I've never blogged such a long post for such a long long time already. Fine fine. Gotta go now. See ya readers! p.s. Sis's birthday next week! p.p.s. Undang test next week!